When self-proclaimed strategic allies like Russia and China fail to see eye to eye, they do their best to mask their differences, issuing communiqués promising amicable solutions at the next round of negotiations, or the one after that. If Moscow and Beijing fall out, the cordiality dries up, and the mutual silence can be deafening. But not this time round. Just four months since the first Russian crude oil started pumping into Daqing, the northeastern Chinese oil town, the Russian pipeline company Transneft has charged the China National Petroleum Company (CNPC) with violating their supply contract, and is threatening to open court proceedings in London. That is a diplomatic way of saying that the current windfall profit between the contract price and the market price of the oil should stay in China’s pocket. Immediately after the May Day holiday, Transneft’s spokesman, Igor Dyomin, has told Asia Times that oil deliveries are indeed running normally, and that negotiations over how much the Chinese should pay are indeed under way. But he stopped short of characterising the bargaining as friendly. The Chinese side, he insisted, is playing “unfair” with the biggest oil supply and loan deal the two countries have ever signed with anyone. Transneft has revealed to Asia Times that the breakdown in trust between Russia and China is focused on the pricing for the oil which Transneft is pumping by its new Siberian pipeline from Skorovodino to the Chinese border, according to a contract signed in 2008 with CNPC. The presidents of China and Russia officially inaugurated the completion of the pipeline on both sides of the border on September 25, last year. But Transneft won’t say what the price formula in the original contract was. Moscow industry sources say the formula is secret, but they don’t know why. According to one of them, OMT analyst Mikhail Mulgachev, the Russian oil which is being pumped to Daqing is known by the name of the pipeline, East Siberian Pacific Ocean, or ESPO for short. Its value is tied to the global Brent oil price marker, he says, but speculates that it is almost certainly at a discount to Brent. How this “reference mechanism” between Brent and ESPO is calculated, according to the contract, has not been revealed publicly, he notes. “We believe it is sold [to CNPC] at a lower price than it is worth.” What the oil is worth depends on which side of the border you are on, and whether you are selling or buying. In 2008, when the Russians and Chinese were still negotiating the terms for the ESPO deliveries, the Chinese reportedly were insisting on a discount to Brent of between $2 and $3 per barrel. The ESPO pipeline project has been dogged by disagreement and controversy since it was first conceived by Mikhail Khodorkovsky’s Yukos more than a decade ago, and initial negotiations with Beijing were conducted by Khodorkovsky’s representatives. Their attempt to break the Transneft monopoly on pipeline oil exports was one of many problems that triggered the arrest of Khodorkovsky in October of 2003, and his subsequent prosecution and imprisonment. The takeover of Yukos by Rosneft, and the replacement of Khodorkovsky as the prime mover in the project by Deputy Prime Minister Igor Sechin did not clear the many negotiating obstacles that arose from both sides. When finally completed in 2009, the Sino-Russian negotiations carried a $25 billion financing from Beijing, the largest loan ever made to Russia, divided between Transneft ($10 billion) and Rosneft ($15 billion). Repayment is tied to the oil flow, its volume and also its price. From the Chinese side, it appears that a preferential state-to-state interest rate was agreed for the loan, on the condition that reciprocal preference was agreed in the way the oil was charged to CNPC. Ahead of the ceremonial completion of the pipelaying, Prime Minister Vladimir Putin said last year: “For China, these are stable deliveries to the country’s energy balance, and for us an exit to new promising markets and in this particular case, to the expanding Chinese market. It now appears this was wishful thinking. The Chinese have also been planning to extend their section of the pipeline from Daqing to Tainjin, where a new oil refinery is planned. However, according to Transneft in Moscow, the Chinese are now demanding that the piped crude should be priced in line with the same marker as crude delivered for tanker loading at Kozmino Bay, on the Sea of Japan — but with the discount accepted by both sides after the last collapse of the marker, when the Brent price dropped from $142 per barrel in July 2008 to $34 in January 2009. The final Sino-Russian contracts were reported as signed a month later, on February 18, 2009, when the marker was between $42 and $45. Kozmino port commenced loading oil tankers in 2010, and by year’s end had despatched 15.3 million tonnes of crude (about 300,000 barrels daily). Destination for the cargoes were: Japan, 30%; South Korea, 29%; US, 16%; Thailand, 11%; China, 8%; Philippines, 3%; Singapore, 2%. The port is now operating at full capacity, so that when the second stage of the ESPO pipeline reaches Nakhodka in 2014, with up to 30 million more tonnes of crude, the plan is to deliver at least a third of that to a new petrochemical refinery to be built close by. At the start of the Kozmino shipments in December 2009-January 2010 – one year before the pipeline to Daqing started delivering — ESPO was priced at a discount to Brent, and also to the Mideast Dubai marker at which the Asian buyers of crude also price their purchases. Russian crude oil (Urals, for example) is usually priced this way because of transport and sulphur differences adding to the cost to process at refinery. 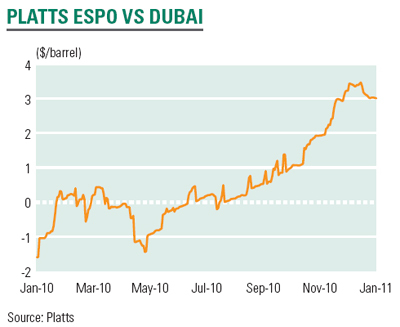 As the specifications (sulphur level, transport reliability) and other uncertainties resolved themselves, ESPO turned out to be “sweeter” (lower sulphur) than conventional western market markers, and started commanding a premium to Dubai. 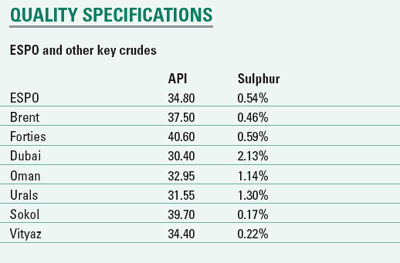 A study by Platts, the US oil monitor, issued in February of this year, reports that until assays of the Kozmino oil shipments confirmed that its sulphur and other specifications made it cheaper to refine and thus more profitable to buy than comparable crude from Dubai, the Kozmino shipments were priced at a $1 to $2 per barrel discount to the Dubai reference price. But by the end of December last, Kozmino oil was priced at a premium to Dubai of $2 per barrel. That extra value appears to be what the Russians now insist the Chinese should pay. If an average $2 Kozmino premium were added to the 311,643 barrels daily pumping through ESPO to Daqing, that would add up to an extra $19 million per month. Transneft claims that CNPC is paying $20 million per month less than it should. Transneft spokesman Igor Dyomin told Asia Times: “We signed a contract with CNPC to value the oil [we deliver] at the market price with the use of market mechanisms. So Transneft uses the Petro-Argus [publication] prices to measure the oil cost at the Pacific Ocean. The Chinese side have agreed on that. Now they go back on their word, claiming that the pricing mechanism is unfair and pointing out the difference in oil prices between Skovorodino and Kozmino. The fact is that the oil price does not include extraction and transportation costs, but the market situation alone. 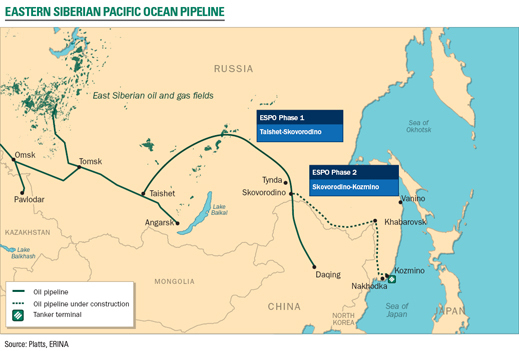 Most East Siberian-Pacific Ocean [ESPO] pipeline oil is taken from the [Rosneft] Vankor field. But there are other fields closer to Kozmino, and still the price is the same. This is unusual outspokenness from the state pipeline company whose chief executive, Nikolai Tokarev, has made a career of secretiveness. All the more curious, says a Russian analyst of state contracting practices, Alexei Navalny. He told Asia Times that the conflict with CNPC is not really with the pipeline company Transneft, but with the oil producer and exporter, state oil company Rosneft. Navalny has filed Moscow court actions as a shareholder of Rosneft for disclosure of the terms of the company’s contract to sell oil to CNPC. He believes the price formula set by Rosneft is “far from a market one”, and accordingly it is understandable why the Russian side wants now to extract more profit from the trade, while the Chinese insist on sticking to the contract formula. Navalny does not speculate on how the oil pricing is tied to Rosneft’s and Transneft’s repayments of their China loans. Taking the longer-term Chinese view, over the 20-year contract term, with deliveries of about 2.3 billion barrels, at annual value at this year’s price average of not less than $10 billion, and if the price average holds up, a full-term value of $200 billion, this $2 per barrel dispute ought to be something the two sides can agree to share — without going to a court in London and without damaging the windfall both are enjoying. If they can’t, the usually reticent Tokarev will no doubt have to explain to Putin why not.